People have been asking me to respond to The Stranger's recent "The Detransitioners" article, especially because I am quoted in it. So this is a (not so brief) statement to that effect. A year ago I wrote a long-read essay called Detransition, Desistance, and Disinformation: A Guide for Understanding Transgender Children Debates - it was my attempt to address the many issues that are usually overlooked or erased in sensationalistic & fear-mongering articles about people who detransition. Between that piece and a shorter follow up post, I felt like I said just about everything I had to say about the subject. 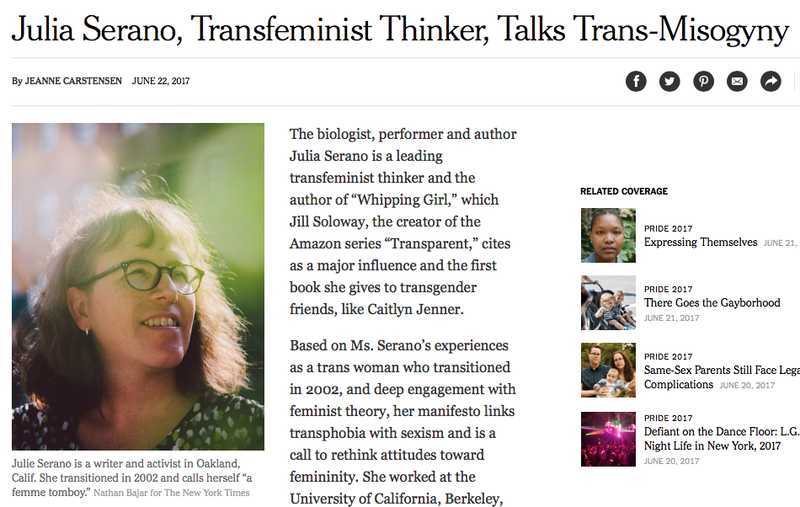 I was interviewed in the New York Times as part of their Pride 2017 coverage - the article is called Julia Serano, Transfeminist Thinker, Talks Trans-Misogyny. You can read it via that link; if it's behind a paywall, here is a PDF version. I wrote a new Medium essay called Debunking “Trans Women Are Not Women” Arguments. If you like the piece, please click the "heart" icon at the bottom of the article - that way more people on Medium will see it! 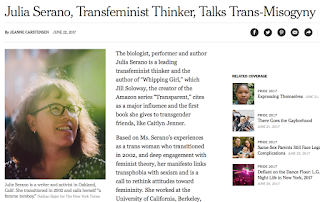 I recently made three chapters from my latest book Outspoken: A Decade of Transgender Activism and Trans Feminism freely available for download - all of them challenge psychological theories and diagnoses that needlessly pathologize transgender people (which is why I wanted to make them readily accessible). Find out how to download them (btw, the linked post also includes excerpts from my novel-in-progress). I am able to make these book chapters and the Debunking “Trans Women Are Not Women” Arguments piece freely available thanks to my Patreon supporters. If you support me there (for as little as $1 per month) you'll have access to behind-the-scenes updates & polls, and unpublished writings & recordings. If you pledge at higher levels, you may be eligible for rewards such as free e-books, signed copies of any of my previous books, and/or choosing the topic of a future blogpost. So if you appreciate my work, please consider supporting me there!